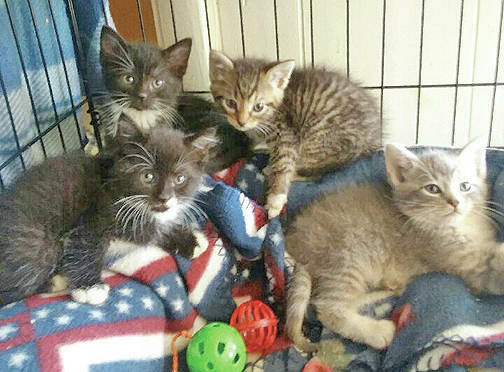 The Highland County Humane Society Animal Shelter Pets of the Week are several kittens. This is the time of the year when there are plenty of kittens up for adoption. The shelter has several litters. If you could give any of these kittens, or their mothers, a good forever home or any of the dogs, contact the Humane Society at 9331 SR 124, P.O. Box 471, Hillsboro, or call the shelter at 937-393-2110. The shelter is open Tuesday to Saturday from noon to 5 p.m. and is closed Sunday and Monday. The shelter is now accepting donations for its yearly yard sale to be held on July 7. Bring any donations except clothing to the shelter. https://www.timesgazette.com/wp-content/uploads/sites/33/2018/06/web1_Pets-of-the-Week.jpgThe Highland County Humane Society Animal Shelter Pets of the Week are several kittens. This is the time of the year when there are plenty of kittens up for adoption. The shelter has several litters. If you could give any of these kittens, or their mothers, a good forever home or any of the dogs, contact the Humane Society at 9331 SR 124, P.O. Box 471, Hillsboro, or call the shelter at 937-393-2110. The shelter is open Tuesday to Saturday from noon to 5 p.m. and is closed Sunday and Monday. The shelter is now accepting donations for its yearly yard sale to be held on July 7. Bring any donations except clothing to the shelter.